Are you ready for winter to be over? Me too! 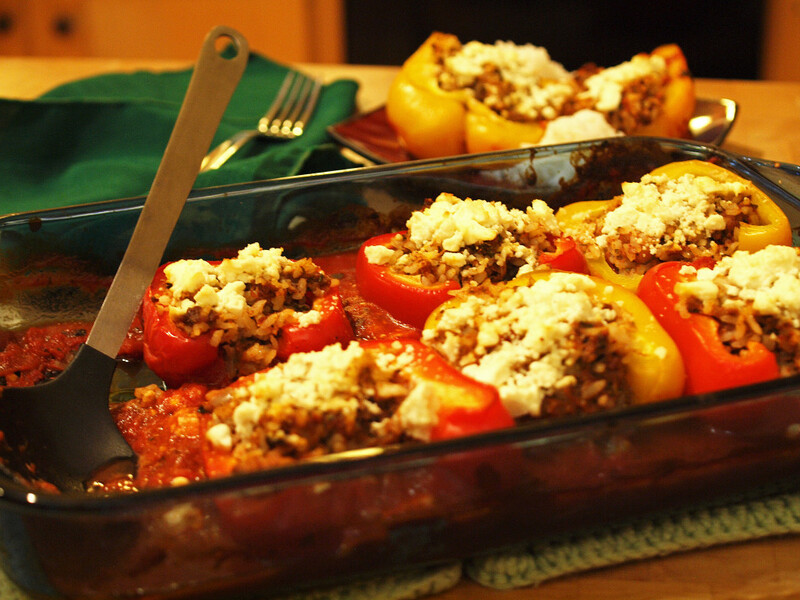 Let’s bring some color back into our kitchens at least with these lovely happy stuffed bell peppers full of beef and spices and covered with feta cheese. Flavors and textures and color, all sorts of ways to chase away the winter blahs! The bright pepper color holds very well through the baking, as you can see, and the sweet flavor of the peppers is a nice contrast with the savory filling. No need to pre-cook the ground beef – this is basically little tiny meatloaf baked in its own dishes. The recipe has a lot of room to play with too, if you’re into changing spices and being adventurous. They can easily be made dairy-free by leaving the feta cheese off the top. I haven’t been in the kitchen as much as I used to be. Life seems to sneak up on me sometimes and I fall back to my old staple recipes instead of trying new exciting things. I am also keeping myself busy taking a couple of great classes, belly dancing and Taiko drumming, which are every bit as much fun as they sound like. Love them both! So, please forgive the recent lack of updating, and I will share more when I can. 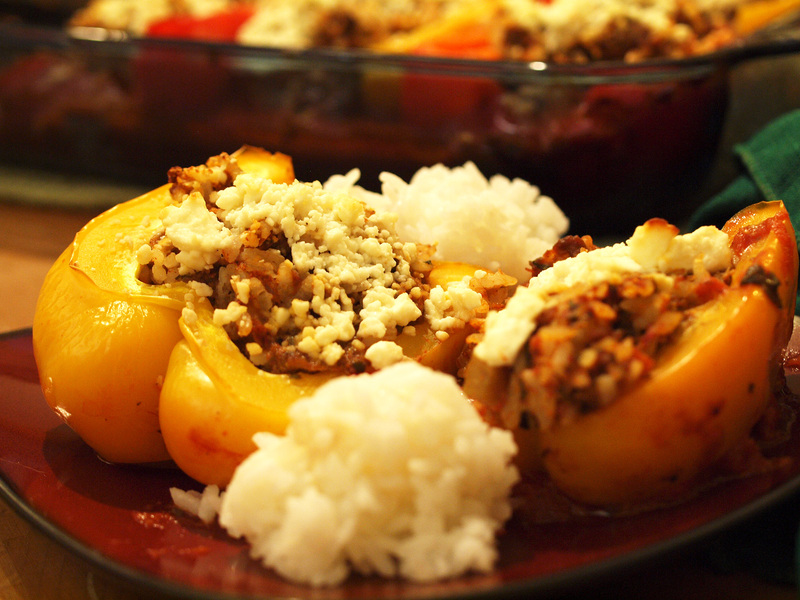 These stuffed bell peppers are so good I absolutely have to share the recipe with you! Don’t worry about it making too much, this is great as leftovers too. Very important before you start – you will need a meat thermometer to make sure these are fully cooked! Alternately you could overcook them on purpose to be sure, but they will lose a bit of the moisture and great texture that way. Still, it’s an option. I recommend serving these with a side of rice, and spoon the hot sauce over the tops of the peppers. Not that I did that for the photos, but I did for the important part, which of course is the eating part. Enjoy! Cook rice and let cool enough to touch. Preheat oven to 350 and position rack in the center. Half the bell peppers lengthwise and clean out the cores and seeds. Set aside. In a large bowl, combine rice, onions, garlic, spices, and 1/2 cup of spaghetti sauce. Add ground beef and egg. Mix thoroughly (hands work best). Spread the rest of the sauce into a 9x13" baking dish and arrange the pepper halves on top. Spoon the filling evenly into the peppers, pressing down as needed. All of the filling should be used. Top each pepper with 1 Tbsp of feta cheese. This entry was posted in Dinners and tagged beginner-friendly, dairy-free.